In Could A Class 399 Tram-Train With Batteries Go Between Manchester Victoria And Rochdale/Bury Bolton Street/Rawtenstall Stations?, I discussed how Class 399 tram-trains might be used on a route in the Manchester area. So how do Manchester’s M5000 trams, Sheffield’s Supertrams compare to the Class 399 tram-train? Does the Class 399 use lightweight stainless steel to give enhanced crash protection and better corrosion resistance? The M5000 is a bit less because it is a shorter vehicle with less standing space. The Supertram and the Class 399 have obviously been built to be able to use the same tram platforms in Sheffield. Wikipedia says this about standard UK platform height. But it would appear that the M5000 is not far from the UK standard height, but the Class 399 is 0.465 metres too low. The entrance height of a Greater Anglia Class 755 train, which is a bi-mode FLIRT is 0.96 metres. 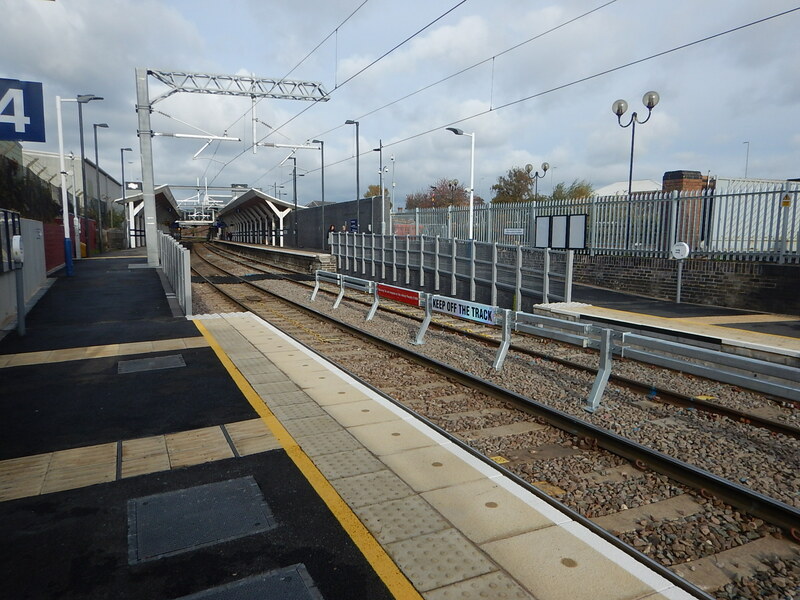 On the South Wales Metro, variants of Class 399 tram/trains and Class 755 trains will share platforms. So Stadler must have a nifty solution to overcome the platform height difference for these two trains, which is similar to that in Manchester between a Class 399 tram-train and an M5000. If it’s on the tram-train, then Stadler have a solution, that will allow Class 399 tram-trains to run on the Manchester Metrolink. The datasheet for the Class 399 tram-train says this about the suspension of the tram-train. Smooth and silent operation with secondary air suspension and resilient wheels. Secondary air suspension is not new on trains, as it certainly featured on British Rail Mark 3 coaches from the 1970s, which have a legendary smooth ride. It can still be seen between the bogie and the coach on many Bombardier trains, which trace their ancestry to British Rail designs. 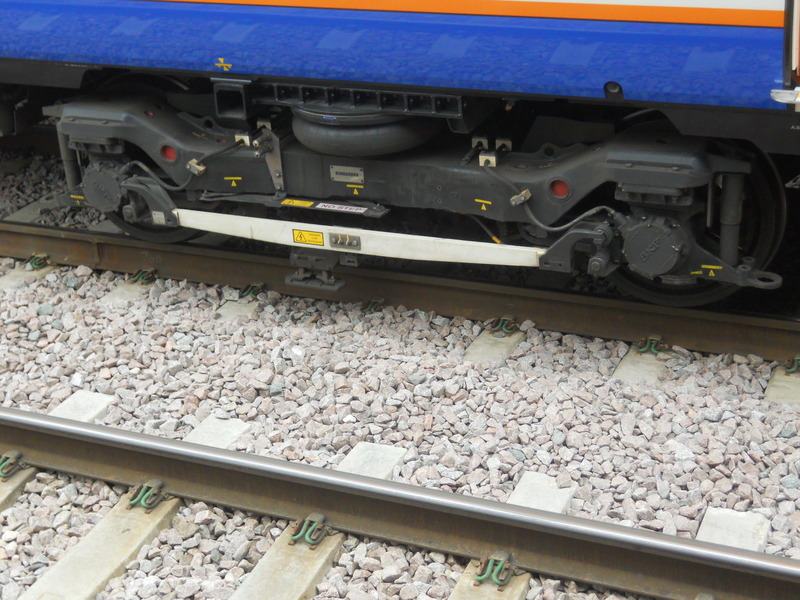 The picture shows the bogie on a Class 378 train. Note the air-suspension above the frame of the bogie. Some cars use secondary air suspension with computers to control the amount of air in each rubber bag to improve the ride and road-holding. Transport for London measure the pressure in the suspension and use this to calculate train loading. I described this application in Is This The Hippest Train Status Displays? Could the air bags be pumped up to raise the train and and reduced in pressure to drop it a few centimetres? There are certainly suspension engineers, in the automotive and motor-sport industries, who have relevant experience and could suggest a solution. All this speculation is a bit like Lew Grasde’s quote on the film Raise the Titanic on which he lost a lot of money. Raise The Titanic? It would have been cheaper to lower the Atlantic! Here it’s a bit of the reverse as if the tram-trains can be adjusted to the platform height, then hundreds of platforms don’t need to be rebuilt. Suppose the platforms were built to fit an existing tram or train. On the Manchester Metrolink the platforms would fit the M5000 trams. On the Sheffield Supertram, the platforms would fit the Supertrams. On the South Wales Metro, the platforms would fit the Welsh variant of the Class 755 train. The Class 399 tram-trains running in Sheffield have their suspension adjusted on mnufacture and in the depot, so that there is level access between tram-train and platform. Could the same tram-trains be adjusted so that they fit the Manchester Metrolink platforms, which are higher? If they can, then Manchester has got a source of off-the-shelf tram-trains. 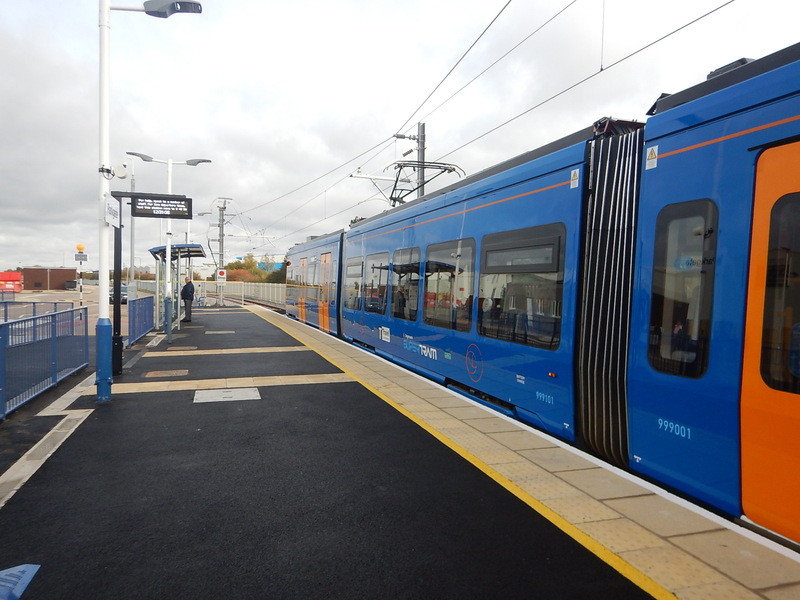 The picture shows a Class 399 tram-train at Rotherham Parkgate. Note the level access at the orange door in the foreground. Manchester would need a different colour as Chelsea Blue wouldn’t be appropriate. The intriguing idea, is can the same Class 399 tram-trains run in both Manchester and Sheffield, with the tram-train’s computer adjusting the ride height to suit the different height of platforms? At present the answer is probably no, as if they could then there wouldn’t be dual-height platforms at Rotherham Central station. Note the slopes down on both sides of the tracks from the high-level train platforms in the background, to the low-level tram platforms in the foreground. It all depends on whether the suspension design is possible. If it is, which I doubt, it would get round the bit problem of platforms on tram-train systems. The Class 399 tram-train is a heavy beast so raising it by much might be difficult, as you changed from Sheffield to Manchester heights. I have talked to Sheffield tram-drivers and their view is that the Class 399 tram-trains handle Sheffield’s hills better with a full load of passengers. The Class 399 has six traction motors, whereas the others have four. So perhaps, the way that the Class 399 tram-train puts its power to the rail with more driven axles, is important. I am convinced that just as Sheffield’s Supertram can work happily with Class 399 tram-trains, Stadler have ways and means of making Manchester Metrolink’s M5000 trams work with the tram-trains. If the Class 399 tram-train is compatible with both tram networks, this will be a great advantage in designing new tram-train routes. It would also mean that one day, a tram-train service could run from Cathedral in Sheffield to Piccadilly Gardens in Manchester via the Hope Valley Line. I suspect that a lot of local services from the two cities will be run by tram-train services, that cross the cities. Manchesters trams are M5000’s, and 28.5m long. Stadler’s Tango concept has low and High floor variants. “Could the same tram-trains be adjusted so that they fit the Manchester Metrolink platforms, which are higher? This has always been an option as many of the German Stadtbah systems have high floor LRV’s. I’ve also put a piece in about power/weight ratio. The 399s have a lower ratio, but fifty percent more driven axles. This must give them their sparkling performance. I don’t know the answer to this but would twelve eight-stone people be able to pull a gun carriage better than eight twelve stone people, as they have more legs to apply distributed power. Bombardier in the Aventra have gone for the full monty, with lots of powered-axles.